San Francisco 49ers quarterback Colin Kaepernick answers questions at a news conference after an NFL preseason football game against the Green Bay Packers Friday, Aug. 26, 2016. The U.S. national anthem takes about two minutes to sing. 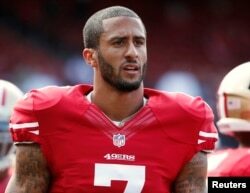 The decision by San Francisco 49ers quarterback Colin Kaepernick to spend that time sitting on the bench Friday night instead of standing along with other players and fans has reverberated for far longer. It continued to be a topic of conversation Monday with reporters at the White House and practice sites around the National Football League asking for reactions, and many of the responses supporting Kaepernick's desire to highlight the treatment of African-Americans while also expressing a wish that he chose another way to do it. Kaepernick, who is the son of a white mother and a black father, said he will not "stand up to show pride in a flag for a country that oppresses black people and people of color." He said he will stand again when the country represents people the way it should, and specifically cited police brutality as an example of something that has to change in the United States. "There's people being murdered unjustly and not being held accountable," Kaepernick said. "People are being given paid leave for killing people. That's not right. That's not right by anyone's standards." Those comments drew criticism from San Francisco's police union. In a letter Monday to the NFL and the 49ers, San Francisco Police Officers Association President Martin Halloran said Kaepernick had a "total lack of sensitivity" and an "incredible lack of knowledge" about police shootings. The quarterback's former coach, Jim Harbaugh was among those who said they think he was seeking change in the wrong way. "I support Colin's motivation. It's his method of action that I take exception to," Harbaugh tweeted. The issue was one that brought no shortage of opinion on social media with users posting opinions ranging from denouncing Kaepernick as disrespectful to the military to comparing his stand to earlier outspoken sports stars such as Muhammad Ali. FILE - San Francisco 49ers quarterback Colin Kaepernick stands on the field before their NFL pre-season football game against the Denver Broncos in San Francisco, California. NFL icon Jim Brown, who played in the 1950s and 1960s, told the NFL Network that what is important is talking about the issues of the country, not Kaepernick himself. He said the discussion is "like going back in time" to his era and cited athletes such as Ali, John Wooten and Bill Russell as "champions of freedom, equality and justice for all human beings." New Orleans Saints safety Kenny Vaccaro told ESPN he disagrees with the manner of Kaepernick's protest, but that it did make a statement. "I mean, everybody's talking about it, obviously, now. And I think that's the point," Vaccaro said. Miami Dolphins defensive tackle Ndamukong Suh was among those who said he understood Kaepernick's actions. "I think it's an individual choice. At the same time, I think it's a duty of ours as leaders, especially with young kids, to make a good, proper announcement if we feel the need to, and I think that's what he's doing." One person who was not a fan of the athlete's actions was Republican presidential candidate Donald Trump, who himself has campaigned on a slogan of "Make America Great Again" while repeatedly bemoaning the state of the country. "I think it's a terrible thing," Trump said Monday. "And you know, maybe he should find a country that works better for him. Let him try, it won't happen." Trump's comments came a day after Kaepernick called him "openly racist." Kaepernick led the 49ers to the Super Bowl in 2013 where his team lost to the Baltimore Ravens. He stood stoically that night as pop star Alicia Keys sang the anthem. He has struggled on the field in recent seasons to the point of battling for a starting spot this year. Kaepernick says he is ready to accept any consequences that may come from his protest. "There's a lot of people that don't want to have this conversation," he said. "They're scared they might lose their job. Or they might not get the endorsements. They might not be treated the same way. Those are things I'm prepared to handle."